ONE VOTE, ONE DOT: An excerpt from The Times’ map of results from the 2005 Los Angeles mayoral primary. Silent L.A. is the black base layer beneath the results. Today we an­nounce the re­lease of Si­lent L.A., a free and open-source base map for South­ern Cali­for­nia. It is de­signed to serve as a black back­drop for over­lay­ing bright data visu­al­iz­a­tions. We put it to use Monday with this in­ter­act­ive map of past may­or­al elec­tion res­ults in the city of Los Angeles. You can see the base lay­er by it­self in this demon­stra­tion map. The source code is hos­ted on Git­Hub. In Novem­ber, The Times open-sourced Quiet L.A., a sep­ar­ate base lay­er with more de­tail than this design. The map is gen­er­ated en­tirely us­ing open data. Roads are provided by Open­Street­Map, a free data­base that could be fairly called the Wiki­pe­dia of maps. The loc­a­tions and la­bels for cit­ies and oth­er places are provided by the U.S. Census via a data portal pub­lished by In­vest­ig­at­ive Re­port­ers and Ed­it­ors. Los Angeles neigh­bor­hoods are provided by The Times’ own Map­ping LA pro­ject, which was built out of a crowd­sourcing col­lab­or­a­tion with Times read­ers. Work on con­fig­ur­ing the ex­ist­ing fea­tures for a new zoom level. Fork the re­pos­it­ory and ap­ply our style to your area. Im­prove the dis­play and size of mo­tor­way la­bels at each zoom level. Spot something ugly and point it out. The tech­nic­al design of Quiet L.A. is heav­ily bor­rowed from Map­Box’s ex­cel­lent osm-bright. The cos­met­ic design was in­spired by Rad­ic­al Car­to­graphy and the Chica­go Tribune News Ap­plic­a­tions team. 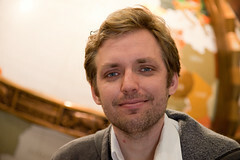 Ben Welsh made this post on Feb. 4, 2013 at 4:30 p.m. Ben has been a data­base pro­du­cer at The Times since 2007. He de­vel­ops news ap­plic­a­tions for latimes.com and con­ducts ana­lys­is for re­port­ing pro­jects. He lives in down­town Los Angeles but grew up in Swish­er, Iowa.